Posted on October 3, 2008 at 8:33 pm. 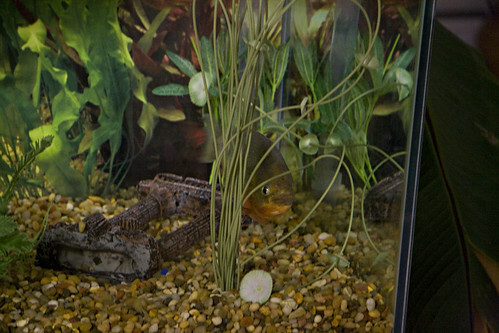 My former roommate, now neighbor, and long time friend Ryan has a pet Piranha he was finally able to bring up to his apartment. 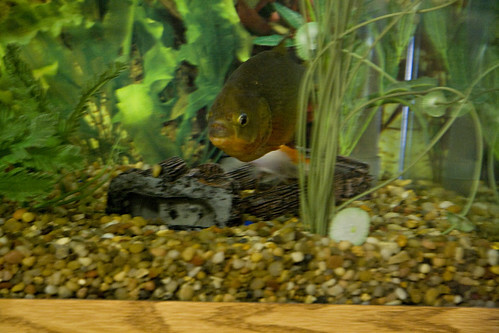 It’s name is Chester, and yes he is a real piranha. Under no circumstances are appendages to be anywhere near the surface of the water, the glass top is removed for cleaning and feeding only. Chester is a few years old, and still going strong. His diet consists of mostly feeder fish from the pet store, but occasionally he gets something alittle bigger. 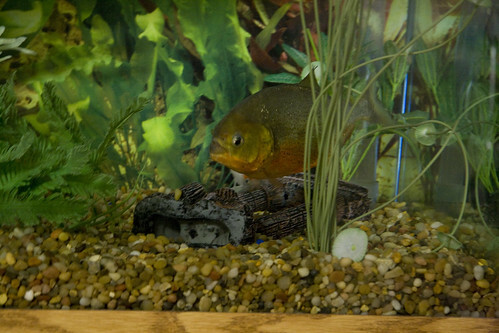 The used to have a seperate holding tank for the feeder fish until the discovered that Chester will only eat when he has too, piranhas are animals that will gorge themselves. So when he’s gone for a few days at a time he can just dump a bunch of feeder fish in the tank and Chester will only pick them off as needed, he doesn’t go on an immedeate killing rampage. I wanted to get photos of Chester eating, but apparently he doesn’t like people watching him, he usually eats at night or when no one is around the tank. We tried though when Ryan placed this Goldfish in the tank. At first the goldfish started schooling with Chester, following him around until Chester took a few instigatory jabs at him. 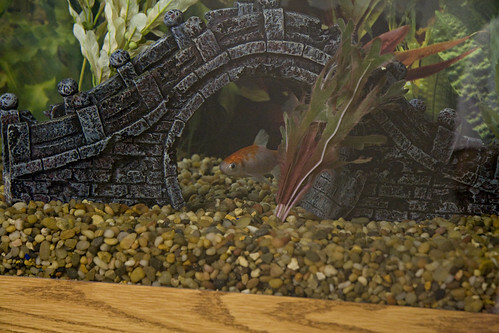 Then the goldfish when to hide and we didn’t see anything else happen. Here are some photos that I got while waiting for something to happen. 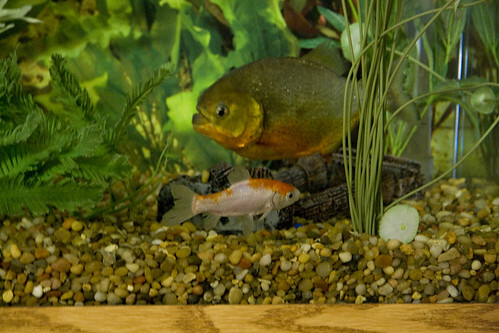 One final note: Piranhas eat live fish! I don’t think the world will miss a few less feeder fish or goldfish. Please don’t start protesting the use of fish to feed Chester, like Ryan’s sister did at one point with a “Save the Goldfish” sign.